I usually don’t think much about cinnamon sugar, Usually, I just put a little cinnamon and a little sugar in a jar and shake it up. If it’s too strong, I add more sugar or not strong enough I add more cinnamon. It wasn’t until my son started asking me how to make it that I even gave Homemade Cinnamon Sugar any thought at all. And then I figured if my son was asking me how to make Homemade Cinnamon Sugar, I thought there might be a few other people out there that would like to know, too. And when I saw Cinnamon Sugar in the store (really? It’s a thing that people actually buy?) I thought I need to put out a post. That’s when I realized there was a better & faster way to get Homemade Cinnamon Sugar than my somewhat disjointed and random method – that there really is a “proper” ratio to the cinnamon and sugar. When I made my Best Instant Pot Steel Cut Oatmeal the other day, I needed Cinnamon Sugar and thought this is the perfect time to take some pics and show you how to make Homemade Cinnamon Sugar, as basic as it is. After a little research, it seems that the right ratio is 1 tablespoon of cinnamon to every quarter cup of sugar. Who knew? But this is the ratio that’s usually used in most baked goods and most streusel toppings and in so much fall baking. 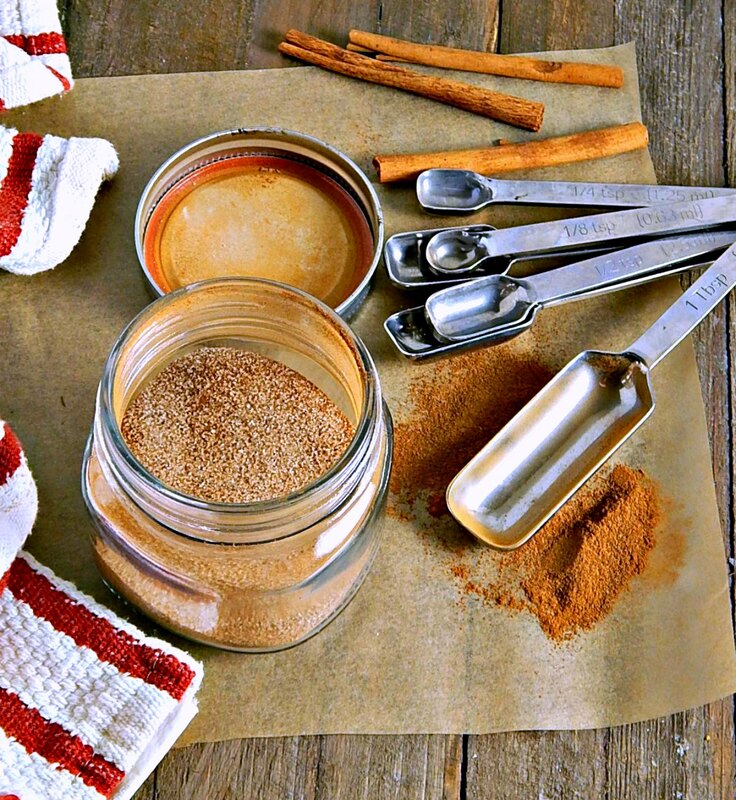 Use this cinnamon sugar to top any muffins you might be making or roll Snickerdoodles or other cookies in. Don’t forget Homemade Cinnamon Sugar to top oatmeal or any other baked cereal or to make Cinnamon Toast. That used to be a favorite after school snack when I was a child! Just mix together your cinnamon and sugar and put it in a jar, or better yet, a jar that has holes in it for sprinkling. I have one somewhere but it seems to be one of those things that just takes up space and it kind of migrates around and I never can seem to find it when I want it. Besides, once something is in that jar, there’s no way to seal it and if you’re not sealing up your jar of cinnamon sugar, it can harden and clump. That made me think of what my Dad used to do for us when we were kids. We’d go out to the garage and he’d take a jar lid and hammer and a big fat nail and pound holes through the jar lid. Dad was never a big home improvement, project kind of guy, but when he did that, he was our hero. Make sure to pound through the top of the lid to the bottom so there won’t be any sharp pieces of metal sticking out of the top of the jar lid. Just put the lid on something that won’t matter if it’s marred from the process and that will give you a good firm surface to pound away on. An old block of wood works great. Then when you’re done, if you use a canning jar lid as I did, you can slip another lid over the top of the one with the holes to seal up your jar. It turns out that if you buy your cinnamon sugar already mixed at the store, it runs about three times as much as it would if you just mixed up your own! I pretty much buy all my sugar at Aldi these days. The prices are great. If you are concerned at all about the kind of sugar you use, you’re definitely going to want to make your Cinnamon Sugar out of the sugar you’re comfortable with. Bonus for being able to control the quality, when you make your own. Watch for spices on sale in the spring, when Mccormick puts out Catalinas in conjunction with store sales and coupons. Catalinas are the little slips you get with your receipt. Sometimes you’ll get a slip that announces the upcoming Catalina and will say something like “But four McCormick Spices between such and such a date, get $3.00.” Then when you buy those items, you’ll get a slip that gives you the $3.00 to use on just about any item on a return trip. Your coupon site will usually notify you of any Catalinas. They’re sometimes advertised in your grocery ad but often aren’t. While $3.00 might not sound like much, at the same time there are usually coupons and great sales. That will often score you your spices for free or for pennies. I stock up on my Vanilla during those spring sales. This entry was posted in Click here for Fabulous Food Posts and tagged cinnamon, Desserts, sugar. Bookmark the permalink. Cinnamon and Sugar – healthy. Healthier w/o the sugar, lol!! Gotta love it, lol! I also noticed with my high efficiency washer some of those stains don’t come out of my dishrags as well! Which always makes me wonder how clean they get anything, but then that’s a whole ‘nuther issue!! Yes! And you can bet I had to have a little cinnamon toast, too! I remember as a kid coming home from school and grabbing a piece (or two) of bread and spreading on the butter and then coating it with cinnamon sugar. Then, under the broiler it went and I would watch and as soon as the cinnamon sugar caramelized out of the oven it came. I’d let it cool and it was like eating candy. There you go giving me another food memory. Please keep it up Mollie. Oh my gosh, Ron, you were a gourmet even then! We had toast from the toaster, then spread with butter and sprinkled. Well, maybe not “official” but it does seem to be pretty common ratio!